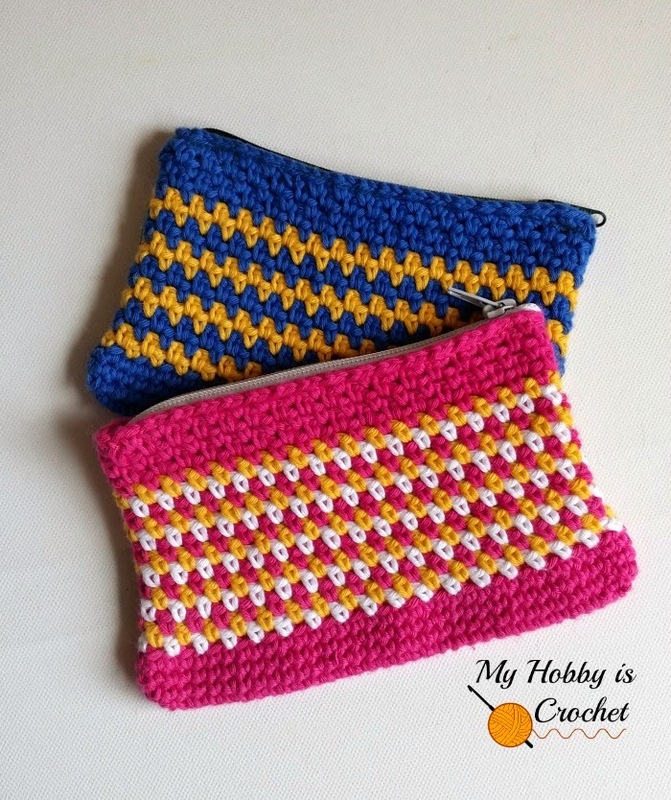 This cute crochet pouch is great to store and carry various small items. With A and a 4 mm crochet hook chain 33. The moss stitch, aka the woven stitch/ linen stitch in the round is multiple of 2. The stitches are worked into the chain 1 spaces of previous round and not the loops of the stitches! Note: For a straight seam of the woven stitch in the round, you will need to turn your work after each round, working one round on the right side and one round on the wrong side (inside) of the pouch. For the zig-zag pattern you will change colors after each 2 rounds. R5: Continue with B; 1ch, 1 sc in same st, *1 ch, sk 1 sc, 1 sc in next sc*, repeat around from * to * till last sc, ch 1, sk last sc, join with sl st to top of first sc. Turn and work on the inside of the pouch! R8: Continue with A the same as R6. R9 - R18 : work the same as R5- R8, always alternating colors A and B after each 2 rounds. You should have 4 zig-zag stripes color B and 3 zig-zag stripes color A.
R19 - R23: work the same as R5 - R6, only using color A; turn your work after each round. At the end of the last round, don’t ch1 anymore and finish off invisibly. Sew the zipper on using your sewing machine, or by hand using the back stitch. 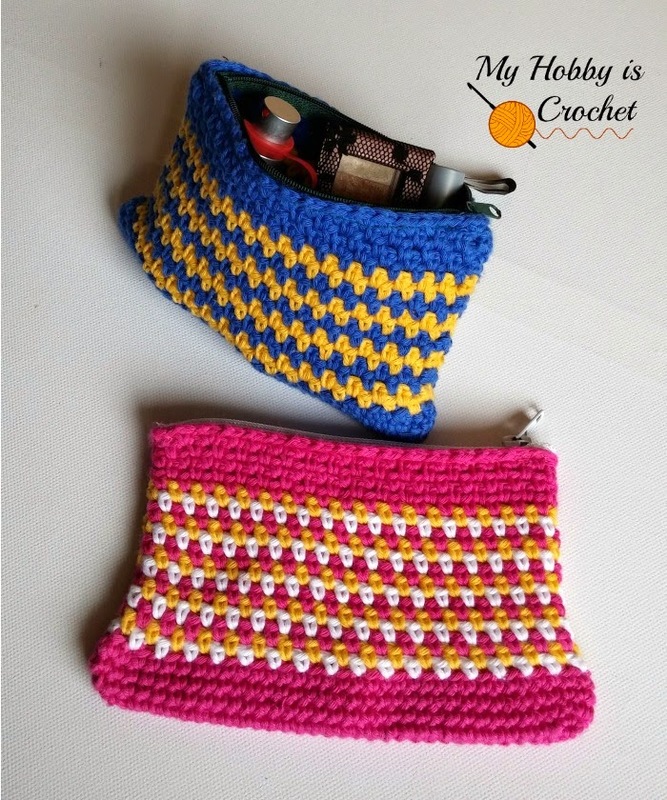 You can also attach the zipper with a Sharp Crochet Hook and crochet thread using surface crochet as in this tutorial by Moogly. If you like, you can also line your pouch before sewing the zipper on. Change colors after each round, alternating the 3 colors. Note: The color change will be made the same way as for the first version, after joining into round with the old color. After you turn to work on the other side, pick new color yarn, ch1 and continue with new color. R6: Pick yarn C and ch 1, 1 sc in first ch sp, ch 1, sk 1 sc, *1 sc in next ch sp, ch 1, sk 1 sc*, repeat from * to * around, sl st to top of first sc. Turn and work on the right side! R7: Pick yarn A and ch 1, 1 sc in first ch sp, ch 1, sk 1 sc, *1 sc in next ch sp, ch 1, sk 1 sc*, repeat from * to * around, sl st to top of first sc. Turn and work on the wrong side! R8: Pick yarn B and ch 1, 1 sc in first ch sp, ch 1, sk 1 sc, *1 sc in next ch sp, ch 1, sk 1 sc*, repeat from * to * around, sl st to top of first sc. Turn and work on the right side! R19 - R23: work woven stitch without color changes, only using color A, turning your work after each round. At the end of the last round, don’t ch1 anymore and finish off invisibly. I hope you enjoy this pouch pattern. If you like the woven stitch, check out also the Woven Stitch Coaster free pattern! For more free crochet patterns, check out my FREE Pattern Page! 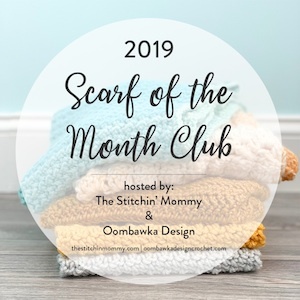 Subscribe to the FREE Newsletter and follow My Hobby is Crochet on Facebook, Pinterest , Bloglovin , Google+, Twitter and Instagram.